So you like wine. A lot. You’ve gone from grabbing a bottle at the liquor store every now and then to having a small collection at home so that there’s always something available to open if the need (or desire) arises. You’ve gone to a few wine tastings at local shops, bought and leafed through a couple wine magazines, tried to talk to sommeliers at restaurants, but there’s a knowledge gap that none of these things can properly fill. You want to LEARN, build a base of understanding about wine that will give you a greater appreciation of every bottle you open. How best to go about it? I was in this exact spot a year or so ago and got some fantastic advice from someone working at a wine store in my neighbourhood. He said that when he decided he wanted to get an education about wine, he went to the bookstore, bought everything in their wine section, and read each book one by one. Sounds simplistic, but it worked: a few months and a dozen or so wine books later, I actually felt like I sort of knew what I was doing in a wine shop, I was less daunted by restaurant wine lists and I could have a reasonably intelligent conversation with a wine expert without coming across like a total fool. (Progress!) And since learning begets learning, the more I read, I more I wanted to. 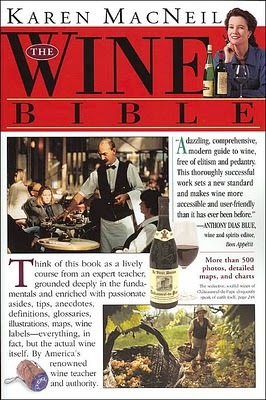 The Wine Bible, by Karen MacNeil: It’s certainly built like a bible — tome-like and 900+ pages long. But don’t be intimidated: it’s written so effortlessly and so passionately that it’s a very easy read. Many wine authors somehow manage to take a fascinating subject with a built-in fun factor (it’s booze, for god’s sake) and turn it into a product with as much charisma as a chemistry textbook, but MacNeil avoids this problem mainly because her love for wine is front and centre on every page. The Wine Bible contains detailed discussions of all of the key wine grapes and regions, as well as recommended wines to try from each of them, a wine jargon glossary, a discussion about how wine is made, and a bunch more. This is without question the book that has taught me the MOST about wine — I’ve read it twice (so far). And it’s criminally cheap: only $15!! This is my desert island wine book. 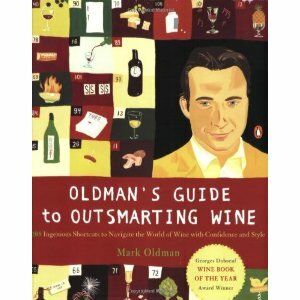 Oldman’s Guide to Outsmarting Wine, by Mark Oldman: At a glance, this is much more beginner-friendly than the Wine Bible: it’s divided into 108 quick-hit segments that are each 2-4 pages long and that cover everything from wine service and restaurant tips to food pairing to common vs. uncommon grapes, styles and regions. It’s written in a very casual, non-technical style and even includes a pronunciation guide (which should be in every book on wine, since strange foreign words beef up wine’s intimidation factor, but is in barely any of them). I just read this book recently but think it would be much more useful to someone just starting to get into wine — it lays out all the basics succinctly but with flair. Super fun read. 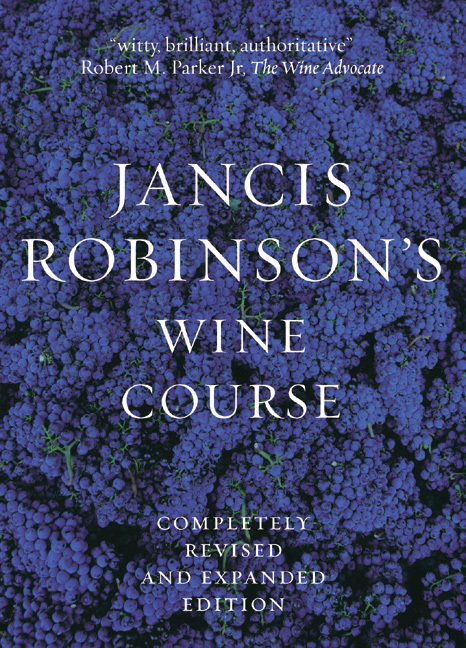 Jancis Robinson’s Wine Course, by Jancis Robinson: Jancis Robinson is a BIG name in the world of wine writers, and her book lays out all of the key concepts about wine in a non-stuffy way (and with colour pictures!). The first 100 pages of the book are why I’m including it in my top 3 list: they contain probably the best discussion I’ve read about how to taste, serve, store and pair wine and about the winemaking process itself. There is a shocking amount of info packed into those initial pages, but it’s presented graphically and in a non-threatening way. Over to you — what’s your favourite wine book? I’m on the lookout for more reading material, so if you have a can’t-miss read, let me know! New wine review coming tomorrow…and since it’s been a few days, I’ll try to pick something special.